Warsteiner | Beer Apprentice - Craft Beer News, Reviews, Interviews and Info. Hi guys. 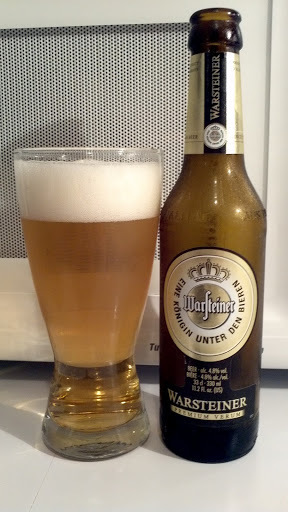 For today’s craft beer review I’m going to be trying the Warsteiner Premium Dunkel produced by the Warsteiner Brauerei located in Warstein, Germany. The Dunkel style has never been one of my personal favorites, however this was one of the first craft beers that I ever tried and it’s been ages since I last had it. I decided to pick up a bottle the last time I went beer shopping to see how I liked it these days. I’m hoping I enjoy it. 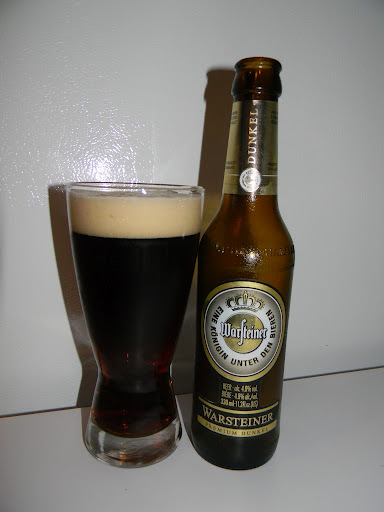 From the website, warsteiner.com, we find this description of the Dunkel. This brew has an ABV of 4.8% and it comes in an 11.2 oz. bottle. It poured a clear, dark brown color with some burnt orange and ruby highlights showing through. The crown was light tan, of decent size, smooth and slightly soapy. The retention time wasn’t all that great and the lacing wasn’t anything to brag about either. The smell revealed a good bit of toasted grain and malts. Light coffee bean hints were intermingled with some sweet caramel notes and decent tones of walnut. Some toasted wheat breads made themselves noticed, but the overall aroma wasn’t very robust or strong. It was adequate I guess. Nothing horrible or off putting, yet nothing “world class” either. The taste was definitely roasted and toasted. More walnut, toasted breads and bits of coffee were found again. It was also quite grainy too with a touch of that caramel sweetness for a bit more complexity. Like the aroma, I didn’t think the profile was very potent or sturdy. Just enough flavor to keep me occupied. It was balanced fairly well however. The mouthfeel was medium to thin bodied. It was smooth and slick, but kind of watery. The carbonation was ok, but only an average amount of flavor was left on the palate after each sip. Well, this was an easy drink for sure, although I thought it was mostly an average beer. It was a bit too grainy for my liking to be honest. I would say that this is more of a “gateway” brew than anything else. Again, not bad or undrinkable, but just not real complex or outstanding in my opinion. I mean, I would have no trouble drinking this if it were offered, but I doubt that I would it out if left with options. Hey, don’t take my word for it though, check the Warsteiner Premium Dunkel out for yourself if you have yet to sample it and see what you think. Thanks for reading and commenting everyone. I can’t begin to tell you how much I appreciate it.